10 sailors missing and five injured following collision between USS John S. McCain and merchant vessel east of Singapore. A U.S. destroyer was damaged in a collision with a tanker east of Singapore early Monday (local time), the U.S. Navy said, according to AFP. 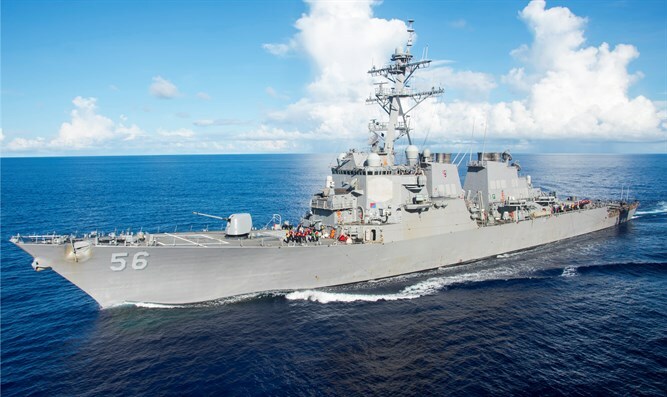 A rescue operation is under way following the collision between the guided-missile destroyer USS John S. McCain and the merchant vessel Alnic MC near the Straits of Malacca. "Initial reports indicate John S. McCain sustained damage to her port side aft. Search and rescue efforts are underway in coordination with local authorities," said the Navy’s statement. "The extent of damage and personnel injuries is being determined. The incident will be investigated," it added. 10 sailors are missing, and five are reported injured following the collision. The rescue operation involves tug boats, a helicopter and a police coast guard vessel, and U.S. aircraft were also responding, the navy said. The ship involved in the collision was a Liberian-flagged tanker used for transporting oil and chemicals and weighing over 30,000 tons, according to industry website Marine Traffic. The accident is the second collision in recent times involving a U.S. warship. Investigators are probing what caused the crash. Japanese investigators have interviewed the Filipino crew of the cargo ship, while U.S. authorities are also probing the crash.